NT Canada. 13th Scottish Light Dragoons. 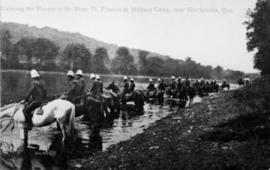 Item is a photograph of military horses lined in a row, drinking water from the St. Francis River near Sherbrooke, thought to be the 13th Scottish Light Dragoons (Waterloo), with Lieutenant Mathias on the white horse. The item is a photograph of (left) Norreys Worthington and Cecil H. Bowen in uniforms for the 53rd Sherbrooke Battalion from about the 1880s.